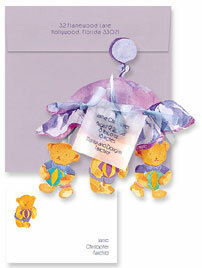 Whatever the occasion J&E has the invitation for you. Unlike other invitation dealers who are simply looking to make the sale, J&E Graphic hopes to earn your business, and at the same time, your respect. We have hand selected our invitation albums from most major manufacturers including Encore, Arlene Segal, Regency, Checkerboard, Artscroll and more. Our intent is to carry the most elegant and unique lines of invitations, thereby eliminating the need for you to browse endlessly, as we know how tedious that can be. We hope to maximize your time, not waste it. With over a decade of experience in the printing business, we have the in-house capability and expertise to custom design and typeset your invitation to “your needs.” While most invitation dealers limit you to layouts presented in the albums, at J&E Graphic there are no limits. Once your invitation is completed, we can address your outer envelopes utilizing our computerized calligraphy addressing system. Simply provide a database of your guest list and we’ll do the rest. There is no longer a need for costly hand calligraphy services or visually unappealing stick-on labels. We can imprint your addresses directly onto the envelopes, matching your invitation’s font and ink color. We strive towards 100% customer satisfaction. All consultations are conducted on a one-on-one basis in an effort to achieve this goal. If you are interested in a truly personalized and pleasant buying experience, please do not hesitate to give us a call. Call our InvitationsDivision @ 718 494 0544 x 14 or email invites@jegraphic.com for an appointment with an invitation consultant. 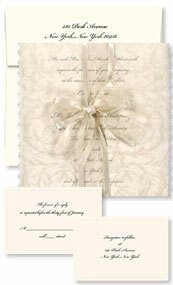 *J&E now offers online invitation ordering for those who don't require the personal touch. View an actual sample of your invite, order it and have it shipped to your door, all online!